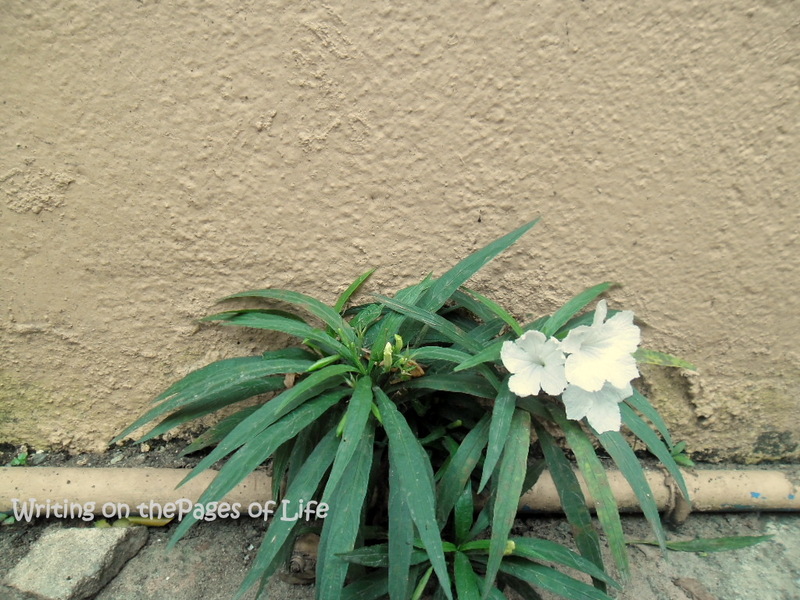 Without any effort from humans, this plant sprouted from a crack between our concrete fence and the floor near our garage. I have always marveled at how plants can grow in the most unlikely places. And they don’t just grow – they bloom and multiply. It is past midnight in the Philippines. I had planned to stay up late to do some work, because we don’t know what tomorrow will be like. I drank two cups of tea to keep me awake and as soon as I finished my second cup, the lights went off…then it came back on…went off…on again and then…it just stayed pitch dark. The rain poured. Yesterday, I wrote in my journal, “Rain in November, God is watering the plants.” The rainy season in the Philippines ends in October. I had been mentally planning my day tomorrow to make preparations for the rescued animals that I care for – all 21 of them. I am not alone – the whole country is preparing for Typhoon Haiyan, which will enter the Philippine Area of Responsibility (PAR) Friday morning, local time. The US Navy’s Joint Typhoon Warning Center (JTWC), said that Haiyan could rapidly intensify from 102 kilometers per hour to 194 kilometers per hour when it crosses the Philippine islands on Friday. According to a news report,”The JTWC’s cone of uncertainty – the potential areas where the storm’s center can go – shows a wide area covering northern Mindanao, the entire Visayas, and southern Luzon.” That means practically the whole country, since parts of the Philippines’ three main island groups will be affected. Fifty provinces are expected to suffer the brunt of the super typhoon, which could equal the intensity of a Category 4 hurricane in the Atlantic. As a point of reference, we are being told that the intensity of Haiyan is the same as that of Typhoon Mike, which battered the country and killed 748 people in 1990. Two of the provinces that lie very close to Haiyan’s path, Bohol and Cebu, had just been hit by a 7.2 magnitude earthquake two weeks ago and thousands of people are still living in tents. The challenge now for the local governments is to look for structures which had not been damaged by the earthquake and to move the people living in the tents into the evacuation centers. Reading this, you may think that life in these islands, which lie on the earthquake and typhoon belts could be quite miserable. On the contrary, just like the plants in the picture, we are an adaptable, hardy and fun-loving people who enjoy organizing fiestas to showcase our beautiful country. I have lived through many storms and powerful earthquakes since I was young. As a child, it was confusing to see rooftops flying and feel the earth shaking. But as I grew older, I understood that natural calamities are part and parcel of life in these islands. There were many opportunities to live somewhere else in the world, but I chose to stay because I simply love the Philippines. This year has brought much devastation to the Philippines. Several powerful storms have passed, taking many lives. The recent earthquake resulted in the death of more than two hundred people and it shook to ruins many of our cherished historical sites. I can just imagine how the people of Bohol and Cebu feel. But is not rare to experience one calamity after another in these islands, and people naturally feel afraid. In 2009, Typhoon Ketsana dumped one month’s expected rainfall in just six hours (more rains than Katrina dumped on New Orleans) and 80% of the country’s capital region went under water.Hundreds lost their lives and many remained missing. We were just cleaning up when news of another typhoon was reported to be heading towards our area again. There were no visible signs of panic, but I will never forget the palpable feeling of dread and fear I felt that day we heard the news. It was as though the streets were shrouded in fear and you could touch it. But there are other memories too. Many years ago, when a super typhoon was heading towards our country, a priest called for prayer vigils to be held in the churches around the Philippines. People prayed and the super typhoon vanished before it entered the Philippine Area of Responsibility (PAR). During another typhoon season a typhoon that refused to leave our country threatened to make a u-turn and go back to an already devastated area. The people flocked to the churches. There was dancing in the streets the next day in that province because the typhoon decided to go straight ahead and leave the country for good. As I sat in the dark earlier, I received a text message from my friend Edwin. The message contained a prayer and a plea to pass it on so we can form a prayer brigade. My sister sent me another prayer brigade message. I dutifully passed on both messages. 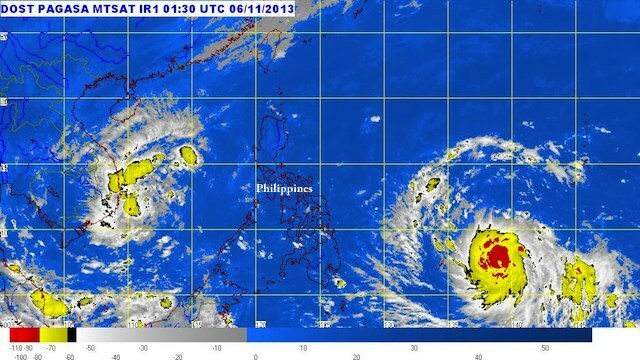 The whole country is praying even as we make preparations for the typhoon’s arrival. The news headlines are not encouraging: Typhoon Haiyan bears down on Philippines; Super Typhoon Haiyan to batter Philippines; Super Typhoon Haiyan to Bring Destruction to Philippines. Thousands have been evacuated and the local governments have been doing all they can to prepare for the worst. Whatever happens, as a country we will continue to thrive through the cracks… and yes, we will be ready to face next year’s typhoon season. But hey, if you feel like praying for us, please do so. It would certainly help. Though I don’t consider myself religious at all, I do believe in the power of prayer, and I will add you and the PAR to my daily prayers. Thank you so much for your prayers, Nancy. Such a profound post about storms being part of life – leveling us in some way to start over. That’s a fresh perspective – new beginnings after storms. Nice. I left your post open to read, as I found the opening so interesting but I was cooking dinner and things … Hours later, the link is still open. I’m glad though. Take care. Oh, wow! I’m definitely sending thoughts and prayers your way! I’m so impressed that given all this you’re still able to blog! Thanks you for your prayers. It is a challenge, but writing about troubling things does help clear the mind and soothes the soul.